The latest celebrity news introduced a new celebrity couple last night on reality TV show The Bachelor’s season finale. Fans have been wondering who Ben Higgins was going to pick, and even Ben himself was very indecisive the whole finale episode. However, at the end he did propose to Lauren B. In the first half of the 3-hour-long finale special, Lauren B. meets with Ben’s parents and tells them that their son makes her happy. She even asks for some relationship advice and talks to his mom about how to get through difficult times, since their relationship has been nothing but happiness so far. Lauren B. made it clear to Ben’s parents that she is in love with him and is ready to be engaged. Now it’s JoJo’s turn to meet Ben’s parents. JoJo, clearly trying to make a good impression, brings flowers and reveals to Ben that she is nervous. With JoJo’s one-on-one with Ben’s dad, she tells him that she is going to love Ben every day, which Ben’s dad appreciates. When Ben speaks with his mom, she says JoJo seems to bring him to a safe place, as the couple has discussed difficult times they’ve been through and even had some adverse experiences throughout their relationship. After meeting both ladies, Ben’s parents discuss what they think of the ladies. Ben’s mom acknowledges that they are very different and Ben’s dad says Lauren B. is polished, while JoJo is like a best friend. Even after this conversation, Ben still has no idea who he will pick at this point. After meeting the parent’s, it’s time for the two ladies to go on their final dates. Both wanting answers about how Ben is feeling, he tells them that he’s honestly confused. The two do not take this well and both tear up at the fact that Ben could be breaking up with them. When it is finally time to pick who he will propose to, it seems like Ben still doesn’t know his answer. It’s not until Neil Lane, the ring designer, comes with the rings that Ben knows who he is finally going to propose to. JoJo is the first one to face the music. She gives this long speech about how she loves Ben and how he has become her best friend. Unfortunately for her, Ben says he loves her but he loves someone else more. JoJo is astonished and cries the whole way home. Ben is still trying to absorb what he just did but knows that Lauren B. is the woman of his dreams. When it’s Lauren B.’s turn, Ben gives her this speech about how much he loves her and she returns the favor. 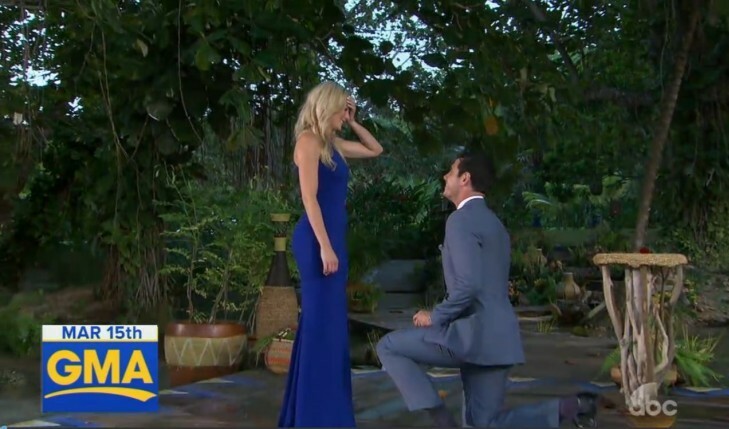 Finally, Ben proposes to Lauren B. After the proposal, there is a live show where Ben talks to JoJo one last time and says he did love her at the time and still cares for her now. However, he knows that he does love Lauren B. and that he made the right choice. If you remember Ben said last week on the women’s tell all that he would get married tomorrow if he could to the lady he picked. So Chris Harrison brought in both of their parents and a pastor so they could get married that evening. However, they decided to wait. For those who were heartbroken that Ben didn’t propose to JoJo, you haven’t seen the last of her. It was announced that she will be the next bachelorette on The Bachelorette so we will still get to see if she has a second chance at love! We can’t wait to tune in May 23rd to watch JoJo find the man of her dreams! Were you happy that Ben chose Lauren B.? Share your thoughts in the comments below!